As we prepare for the inauguration of the new Mexican government that you are going to lead, international human rights organisations attentively address you in order to express our concern over the serious crisis that Mexico is experiencing in relation to the right to defend rights, and urge your administration to include, as a central theme in its human rights agenda, an end to the criminalisation of human rights defenders in Mexico. In Mexico there is a serious pattern of criminalisation of social protest, evident in the existence of numerous cases of arbitrary detention and unfounded judicial proceedings which have violated the right to due process of human rights defenders in the country. This phenomenon is particularly serious because of its evident aim of paralysing and delegitimising the causes for which human rights defenders fight. 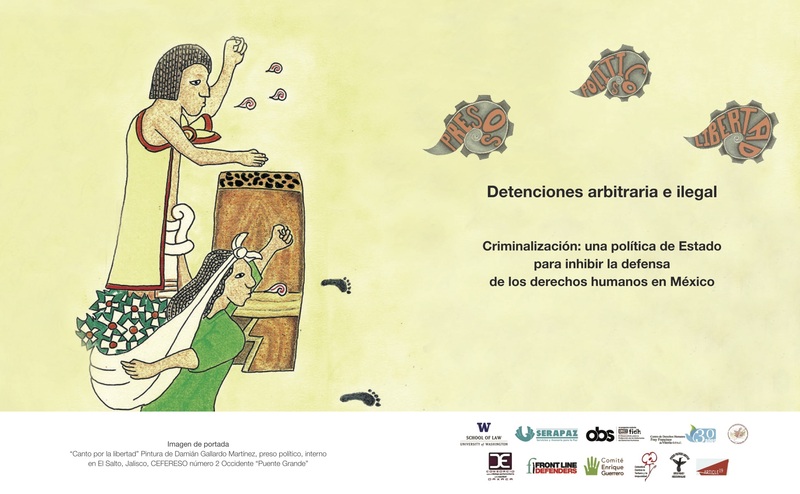 The pattern of criminalisation in Mexico has not only been repeatedly denounced by non-governmental organisations, but has also been confirmed by the United Nations through its Working Group on Arbitrary Detention. The Working Group has issued 8 Opinions - which remain unenforced - in which it declared the arrest of 32 different human rights defenders to be arbitrary and demanded their immediate release. Five of the opinions were issued in the space of just over one year, between August 2014 and December 2015. This was an unprecedented event, since it was the first time that the Working Group issued such a number of opinions on the same country in such a small period of time. Our organisations are particularly concerned about the high rate of criminalisation against defenders in the state of Oaxaca. This has also been pointed out by the UN, which has previously highlighted the existence of a pattern of violations against human rights defenders there. Indeed, 6 of the 8 Opinions issued by the Working Group are on cases of defenders from Oaxaca, including the cases of Damián Gallardo (Opinion 23/2014), Enrique Guerrero (Opinion 55/2015) and Librado Baños (Opinion 19/2015), as well as a collective case that includes 22 members of Sol Rojo who were arbitrarily detained in 2015 after attending a public demonstration (Opinion 17/2016). It should be noted that in addition to the cases already mentioned in which there have been UN Opinions, our organisations are aware of at least 6 other cases of defenders who are facing criminalisation in Oaxaca. Our organisations express their concern over the situation of defenders in Oaxaca, where the defense of human rights not only implicitly results in criminalisation of social protest but also involves particularly serious violations of human rights such as forcible exile, illustrated by the case of the indigenous defender Juan Sosa Maldonado, who has been in exile since 2013 after suffering a serious attack on his life, and forced disappearance, as in the case of human rights lawyer Ernesto Sernas García, who disappeared on 10 May 2018. In light of the foregoing, our organisations emphasise the urgency of the implementation of safeguards for the work of human rights defenders in Oaxaca. We also highlight that it should be of great priority for the incoming government to respond to the requests of the families of criminalised human rights defenders, as well as of the organisations they represent, in order to show its commitment to the resolution of this crisis in Oaxaca and as a necessary step for action on the worrisome situation in the whole country. We also highlight that our organisations reject an alternative where criminalised human rights defenders may be beneficiaries of an amnesty, and demand in return that their release take place without leaving room for doubt over their innocence, through the resolution of their processes according to law, respecting all international human rights standards and in full compliance with all the UN Opinions. The cases of Norma Cleyver Cruz Vazquez, Nicasio Zaragoza Quintana, Teofilio García López, Felipe Rojas Ordunio, Joaquín Zárate Bernal and Antonio Zárate Bernal.